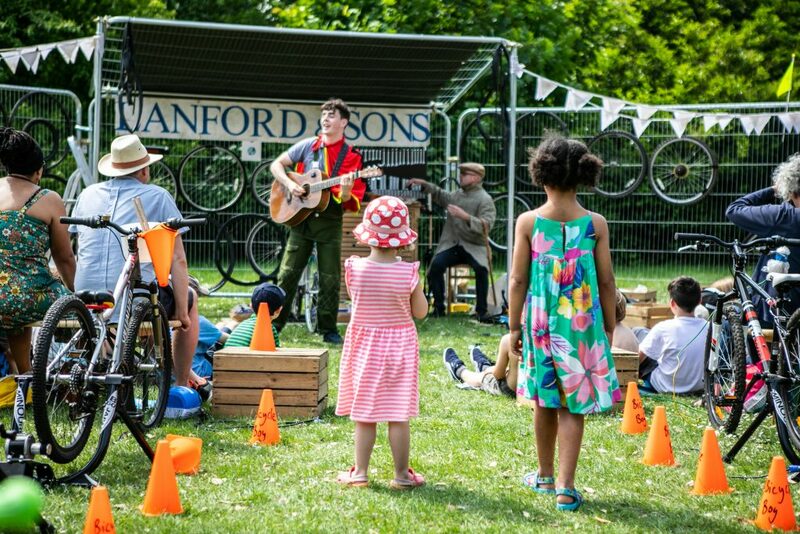 A bicycle-powered musical, for children aged 6?10 and their families. Do you remember riding your first bike? Without the stabilizers? Sam and Mike loved their bikes as kids and spent a lot of time pretending to be superheroes, ‘Bicycle Boy’ and ‘Pedal Power’. Now they’re grown up and need to clear out their granddad’s bicycle workshop. Join us for the story that unfolds ? with songs, laughs and lots of interaction. We may even need you to hop on a bike and power our show! A bicycle-powered musical, for children aged 6?10 and their families. By the end, our audience will be pedalling away to power the performance. Bicycle Boy is an interactive show about who we are, the world we want to live in, and how we hold on to our childhood dreams. It tells the story of Sam, who is clearing out his granddad’s old bike workshop. Granddad was a bit of a hoarder and there’s a myriad of stories hidden in the clutter. With songs and music (and much percussion played on spare bike parts) this is a celebration of pedal power. Helen Eastman makes work for children and families that is interactive, creative, riotous fun and explores the complex world we live in. Here she works with long-term collaborator, composer Alex Silverman, whose playful music is woven through the work (and played on a lot of bike parts as well as instruments). This is about creating experiences for children and their family of the highest quality, with loads of fun. Originally developed at Oxford Playhouse Plays Out. Co-commissioned by Without Walls, Brighton Festival, and Hat Fair.